My favourite felt accessory of the moment, raw materials for US workshops and a picture of my new fibre friend! If you are a regular follower of this blog you will know how hectic things have been here at Clasheen since my return from ‘Felt Naturally’ in Silkeborg at the beginning of August. Laying out and felting Sylvia’s large rug took a lot longer in actuality than in planning, partially due to the logistics of scaling up to such a degree (especially without another pair of hands!) and partially due to interruptions with Lady Captain duties at Borris Golf Club. I did however manage to fit in a few small projects between other committments and one of the pieces that I felted is definitely one of my all time favourite accessories, a real conversation opener whenever I wear it at the moment which to be honest is quite often! Charlotte Buch needs to be credited with the design and was very generous in sharing the technique used with all of us who participated in her long workshop in Denmark. Because I was totally focused on felting my sea creature it wasn’t until I returned to Clasheen that I actually got to try out this method for myself and I absolutely LOVE the versality of the finished piece! In the workshop many participants felted this boa starting with a base of prefelt but for mine I decided to start from scratch and use some of the gorgeous hand dyed merino roving I recieved from Holly as part of the New Year Secret Scarf Exchange organised via Ravelry. The boa may be twisted a couple of times around the neck as a necklace, wrapped around the waist, worn as a scarf, tied around a ponytail and in many other ways which might grab the wearer at any given moment. This felt accessory just goes to demonstrate how totally versatile and adaptable one simple design may be and if you would like to see some of the other ways which I wear mine have a look through my Flickr photos. Another amazing advantage of felting this piece is that my horror of a sewing machine has almost disappeared, honestly! Charlotte uses either an embellisher or a sewing machine (depending on the end result required) during the early stages of some of her work and to be honest once I saw how simple various of the techniques were and the amazing results on offer I have had a major head change with regard to the use of these frightening pieces of equipment (frightening to me!). This brings me on to another point which I feel is well worth making before I head over to the US next week. Many different raw materials may eventually lead to a similar end result and many different end results may be arrived at by numerous different people all starting from the same point and using the same raw materials! This is something that I can’t stress enough for anyone considering joining me at one of the exciting workshops that are planned for Loomis, Berkeley, San Fransisco and Kalamazoo over the next 4 weeks. Please don’t feel that you have to copy exactly what I do or use the same fibres and other raw materials that I choose to use but obviously you are welcome to do so if that is what you so wish! What I will be providing is an insight into how I work, what I find works best for me (I am ALWAYS learning and discovering new materials and texchniques! ), sharing some of my own favourite pieces and bringing along with me as many raw materials and embellishments as possible to examine with all of you thereby providing a felting receipe which you may choose to follow or totally adapt dependent on your own wishes. What I would like all participants to do is to bring with you as many or as few of your own felting materials, found items, stash goodies, jewellery findings and equipment as you can comfortably transport (in a bag or in a truck!!!) and then we can look at the ways in which you work and find the direction and materials you are comfortable experimenting with in order to create some fabulous and individual pieces during the course of the various workshops! Is it obvious HOW EXCITED I am to be finally meeting so many of you in the flesh??? Lastly, here is a picture I took of a fibre friend from La Gomera and I have now installed her as my desktop background because I think she is just gorgeous!!! 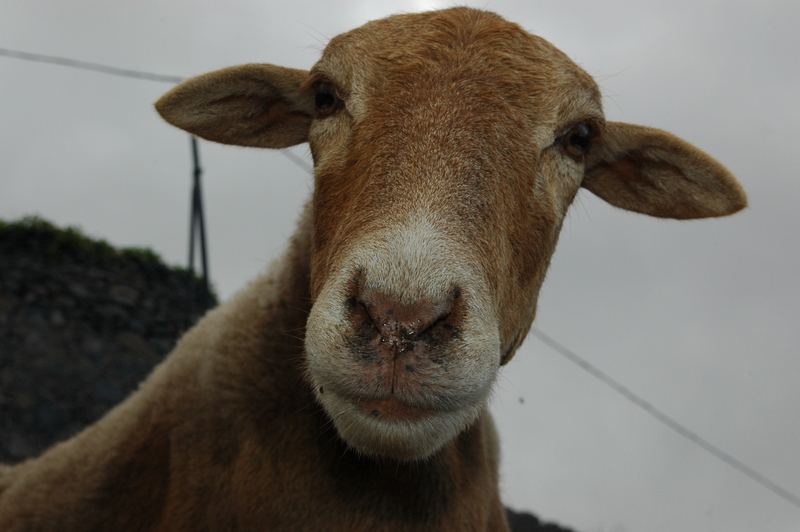 My fibre friend from La Gomera! This entry was posted in America 2010, Felt, workshops and tagged American workshops, Charlotte Buch, Felt, felt accessories, felt accessory, felt boa, felt workshops, Felting, La Gomera, wet felt, wet felting by Nicola. Bookmark the permalink. Your new felt boa has to be one of my all time favorites…I just love it. I’d be wearing it all the time, too. Hope you’ll be bringing it along when you come…I’d love to see it in person. You’re so right about all of the different felt-making techniques/materials. We all find what works best for us. I think we develop our own personal style and technique based in part on how our bodies work. What may come very naturally to one person, may be awkward to another, and vice versa. But, I love learning about different processes and techniques…It’s really one of my favorite aspects of class time. I always learn from both the instructor and the other students…Oh, I’m getting so excited to have you here…Can hardly wait:-) Hurry, hurry, hurry…. I enjoy reading all your postings – wish you were coming to Washington, DC. The boa is gorgeous! I also like your new fibre friend! I like your approach/philosophy for teaching felting already! I’ve found the same, that there are sooooo many ways to achieve a certain result. I can’t WAIT to attend your classes in Kalamazoo, safe travels across the pond! 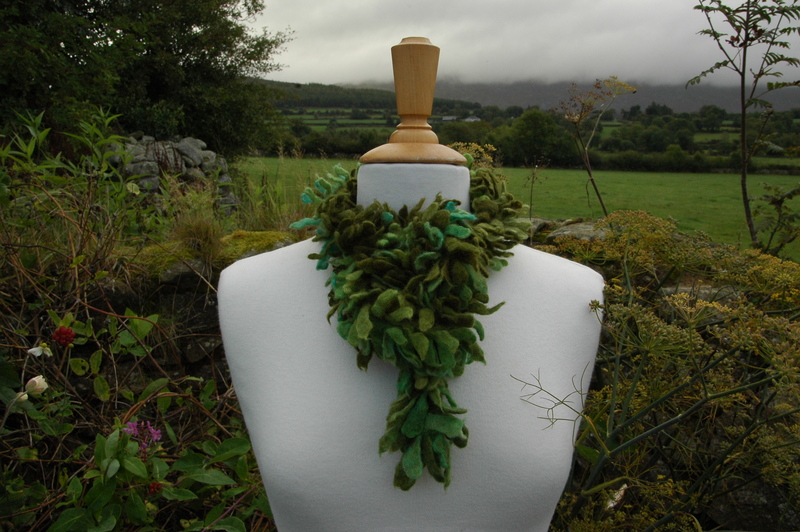 This boa is gorgeous Nicola, and the hand dyed greens are so beautiful. I would wear it for the rest of my life.